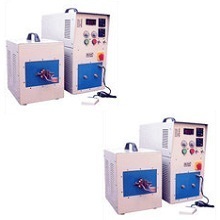 Manufacturer of a wide range of products which include induction brazing machine. Boss Engineers is your one source for all your induction brazing needs; we are offering a wide range of Induction Brazing Machine. In our Induction Brazing Machine family we offers a many types of machines as per customers requirements like. We also offers turn-key solutions to all your brazing requirements. Fast heating system, as compare to open flame or furnaces. Require very less space and reduce the main power.